When Mitch Mayers sat down to plan the opening menu at his Ballard restaurant, Sawyer, last summer, he wanted to serve a traditional matzoh ball soup. But the former Lark chef de cuisine was opening doors in late summer, and his sous chefs encouraged him to think about something more seasonal. 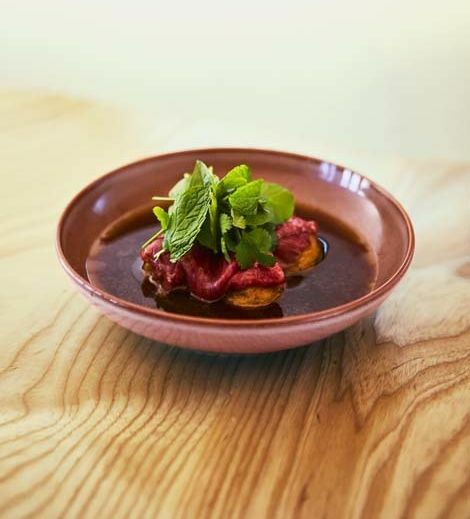 The result turned out to be one of the most talked-about dishes on the menu: matzoh balls afloat in a Vietnamese-inspired bone marrow broth — using the acidity to cut the richness and make it a better warm-weather fit. “I never expected a reaction,” he admits, but loves that he can put his Jewish heritage on the menu. At her Queen Anne Coffee Company, Bri Ryan, a former graphic designer and hobby baker, agrees. She incorporates her own family traditions into the baked-from-scratch pastries at the hilltop shop. “I grew up making challah with my family,” she says, so when she opened, she modified the recipe for both her challah-dough cinnamon rolls and her signature challah pretzel rolls. But when it came time to put matzoh ball soup on the menu, she stuck to her mother’s traditional version. “It’s pretty directly her recipe,” featuring straightforward matzoh balls floating with organic chicken breast meat in a classic broth of carrots, celery, onion, and herbs, Ryan says. But that doesn’t mean she always sticks to tradition: For Passover, she will serve coconut-almond crusted cheesecake, matzoh pizza, and her own macaroons, made with molasses to help caramelize the coconut and sprinkled with sea salt.